Have you ever seen a car wear a bracelet? | Nan Tubre Writes . . .
Have you ever seen a car wear a bracelet? Well, I have and I make them too! 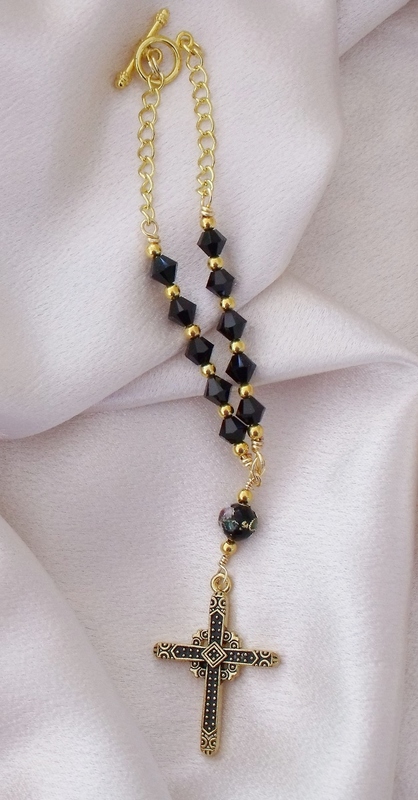 I never was one to hang stuff from my rear view mirror, even when I was (much, much) younger and my friends would ever-so-proudly hang their graduation tassels from their car mirrors. It just wasn’t my style. I’ve seen rear view mirrors heavily laden with so much stuff swinging around, it’s a wonder the driver could see to navigate safely! Mardi Gras beads, dog tags, feathers, dream catchers, and, of course, the multi-generational dice. You name it, I’ve seen it. 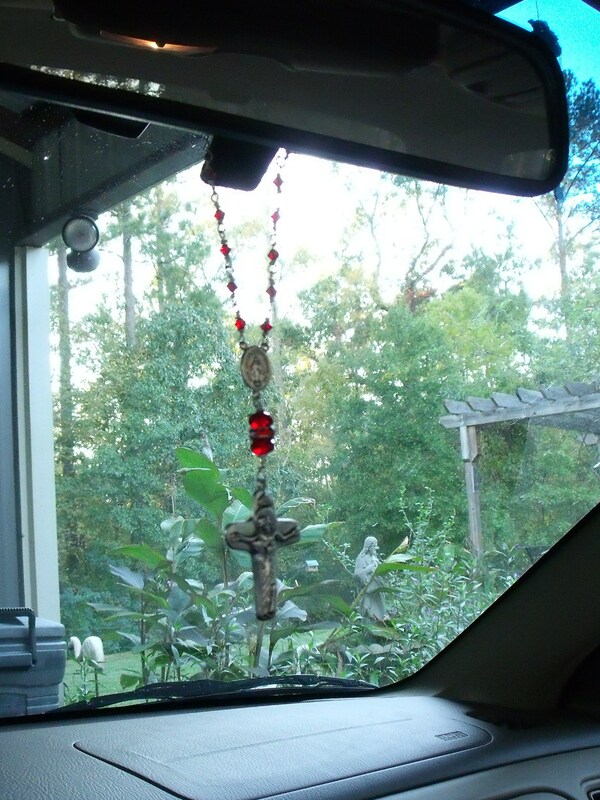 Once in a while, I would see a simple cross, or other small object of devotion hanging from a rear view mirror and the act of someone displaying a sign of their faith touches my heart. 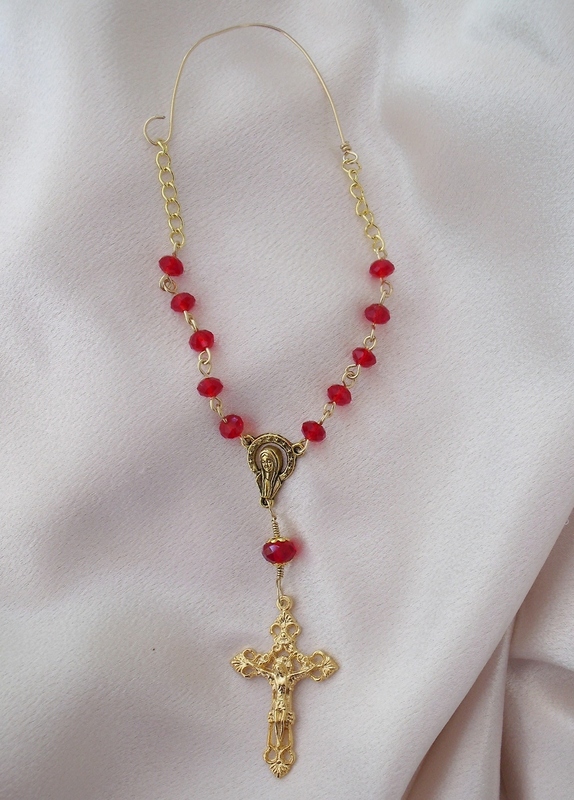 That’s when I got the idea to make myself a car rosary – I call them car bracelets – imagine my surprise to discover that I’m not the only one who has thought of this! Since I began making them, I’ve begun to notice them more in cars. It gives me comfort knowing that I take a sign of my faith with me everywhere I go. It’s not for show, it’s not for other people to notice. It’s for me and it reminds me that God loved me so much that he chose a sweet humble woman to be the mother of His Son. It reminds me that she said “Yes” in faithful obediance to God. It reminds me of the sacrifice her child willingly made to bring the human race into communion with God. Most of all, it reminds me to pray, continuously pray. 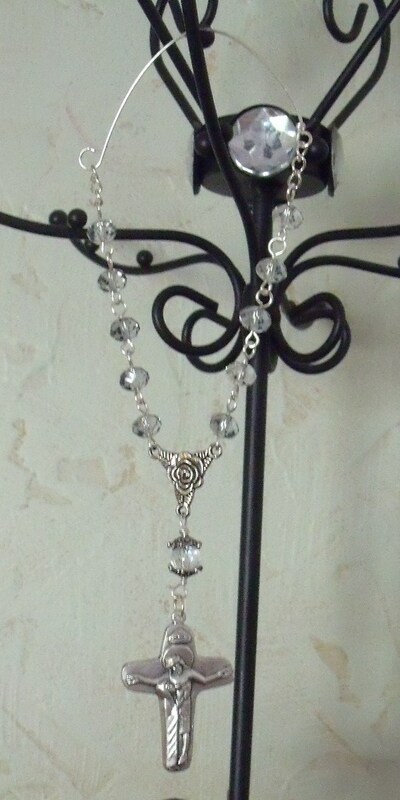 I have several different car bracelets/rosaries in my etsy shop: www.etsy.com/shop/nanaspocket Check them out and choose the design that best reminds you of your faith. Use coupon blogfan1 during checkout and you’ll receive a 15% discount! Thank you! It’s strictly trial and error!